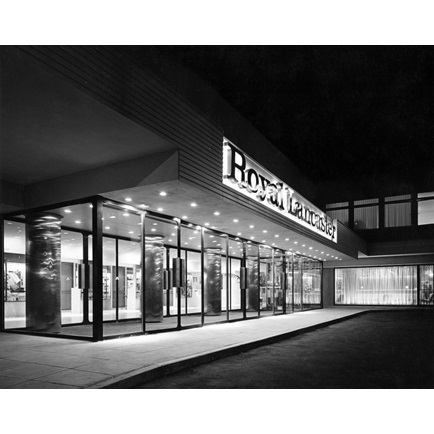 Our hotel opened in 1967 and was initially called “Royal Lancaster”. But where did this name come from? Lancaster is a town in north-west England, with a rich history and home to the influential House of Lancaster – the victorious faction during the War of Roses. Their title and heritage were later inherited and absorbed by the current British monarchy. To honour Queen Victoria, one of the grand entrances to the Kensington Gardens was thus named “Lancaster Gate”. Starting from the end of the 19th century, the name spread to the nearby area – previously known as “Upper Hyde Park Gardens”. The local underground station on the Central Line opened in 1900, and was named after the area. The brand new “Royal Lancaster London” hotel crest pays homage to the past by featuring a stylized rose. Why? That’s because the symbol of the House of Lancaster was indeed a red rose! The hotel’s “Nine Kings Suite” is yet another nod at history, referring to the line of nine English kings that followed immediately after John of Gaunt, first Duke of Lancaster. On the other hand, the “Westbourne Suite” takes its name from what’s underneath our hotel… the small river Westbourne! Originating in Hampstead Heath, this brook used to flow into the Thames. It entered Hyde Park at what is now the Serpentine – which was formed in 1730 by building a dam across the Westbourne on the wishes of Queen Caroline, wife of George II, to beautify the royal park. Founded in 1937, the Rank Organisation was a huge British entertainment conglomerate – with sprawling business interests and a focus on film-making. In the original intentions of the company, the imposing tower that now hosts Royal Lancaster London was designed to host their offices, rather than be a hotel! The tower was designed by the famous architect Richard Seifert (1910 – 2001), who was extremely prolific during the 60s and 70s. His unapologetic and stark design has earned him both admirers and critics – but one fact is sure: no other architect is responsible for as many buildings in London (not even Sir Christopher Wren!). 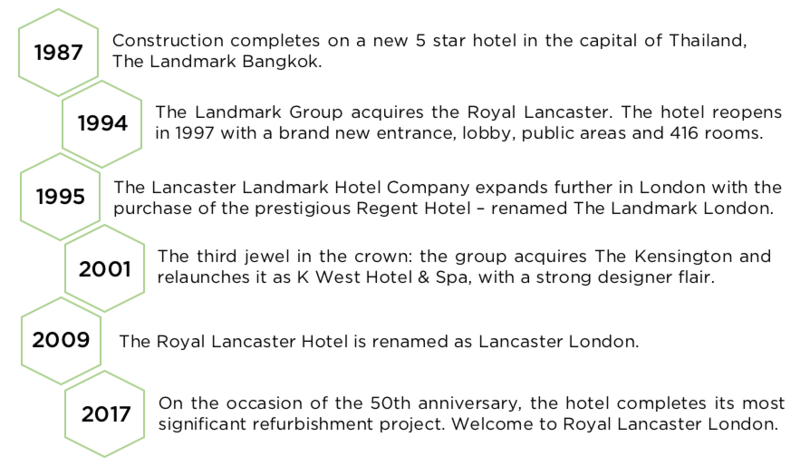 However plans changed quickly, and in 1967 the Royal Lancaster Hotel opened its doors – under the same owners. Why the sudden U-turn? In the 1960s London was a very different place, with scarce hotel space that could not keep up with growing numbers of tourists. The UK Government therefore decided to award £1000 grants for every new hotel room built.